Nadine has picked her wedding dress...and it's gorgeous! After one false start with a dress that was pretty, although a little casual but still unique in it's own way, she went the complete opposite direction and picked over the top DRAMA! It's an Oleg Cassini and the pictures speak for themselves. The best part about the dress is it can look good on lots of different figures...but it looks absolutely beautiful on Nadine and she feels like a princess in it. Finding the perfect dress is kind of like finding the right guy...when it's THE ONE, you just know! But how do you pick when there are so many different styles and prices from which to choose?! Well, I can tell you what you don't do...you don't herd up your whole posse of girl pals or your eight bridesmaids and hit the bridal stores. The only thing you'll get with that is a whole posse full of different ideas and eight different opinions on which dress looked the best on you. Do your research BEFORE you hit the stores. Go on line and look at dresses. Make notes on the designer, the dress number and most importantly, the price. 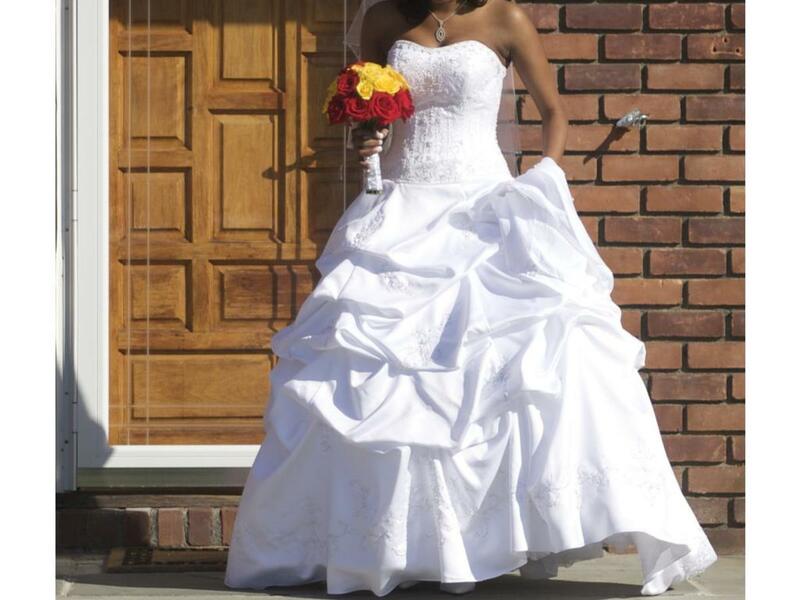 Nadine found her first choice dress at a price range anywhere from $280 to $600. Check out bridal magazines, but don't invest in a ton of them. That can add up quickly at $10 or $12 a pop! Go to a good library that has a nice periodical sessions, bring change, and xerox pictures of gowns you like. Then try to locate them on line which is not hard if you know the designer. Keep a file of your favorites and the price range you find them. This can be a good bargaining tool for you once you do hit the bridal stores. Secondly, all the beautiful dresses in the world won't matter if it's not the right dress for YOU. Things can look very different in a picture or on a hanger than they do on YOUR body. Try this experiment: look through your closet at dresses you love, that you feel good in, that you receive compliments in every time you wear them. What is the common thread? Is it maybe an A-line skirt that shows off your waist or a pretty neckline that flatters your beautiful shoulders? Once you figure that out, it will help you to pick out a dress that has those same figure flattering features. As you're collecting your pictures and your ideas on how you would like your perfect dress to look, you are keeping them in some sort of file, right? That's really a smart idea for your entire wedding even before you get that shiny rock on your finger. I know people who collected ideas before they even had the GUY, for goodness sake! Keeping a file helps you keep those ideas where you can find them, so you will have something to refer to when you start searching for real. Nadine went to a bridal store first and tried on several dresses until she found one she really liked. However, she went on-line and found it several hundred dollars cheaper. With wedding dresses, it pays to shop around, especially if you, like most brides these days, are on a budget. However, the dress Nadine ultimately chose was a dress from a discount bridal store in her home town which ended up costing more than the on-line or in store price of the original dress she chose. Go figure! The difference...the first trip to the bridal store was in the town where she lives and she went with a friend. The second time she went to the bridal store was in her old hometown and she went with her mother. When she tried on the dress that made then both cry, she knew she had found the one! You don't need to take a cast of thousands with you when you go to the store, just an honest friend with excellent taste or your mother...and you can't get much more honest than that! Nothing turns a beautiful bride into a bridezilla faster than a dress that doesn't fit. Alterations can be done on wedding dresses, but are much more difficult than on regular everyday wear, because of the fabrics, intricate beading, etc. Some fabrics when let out will leave a seam mark, particularly in very fine silk or satin. 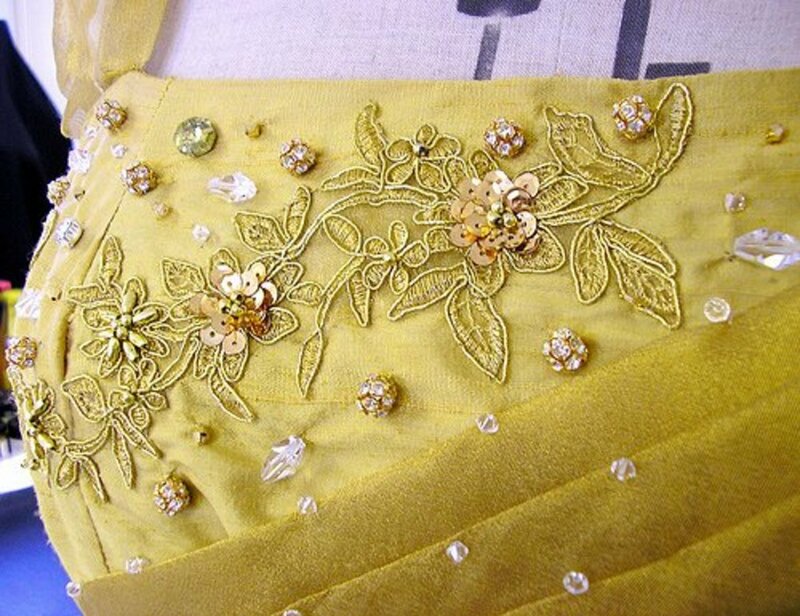 Also, there is the issue of the beading and sequins possibly having to be taken out and re-sewn as dresses are taken up or let out. My sister, who is a seamstress and had done many wedding dresses says she would rather make an entire wedding dress from scratch than do alterations on one. So make sure whether you buy a dress on-line or in a bridal store, you have an experienced seamstress to do your alterations...it could save your friendships and possibly your marriage before it ever even starts! Now Let's Walk Down that Aisle! Your wedding dress is a big decision, without a doubt. But with care, you can make not only a wise choice, but one you won't regret. As Nadine says, she wants everyone to go "Wow" when she walks down the aisle. The "wow factor" is important, but make sure the dress suits you, your personality, and your budget. You don't have to break the bank to have the dress of your dreams. And remember, whether your dress costs $100 or $10,000, at the end of the day, you'll be married to the MAN of your dreams. And that's really what matters, right? Shannon, OneWed is my absolute favorite. So many beautiful dresses, so hard to make a decision! The photos from www.onewed.com and www.dressilyme.com are absolutely fabulous! You're right, WF! And welcome to HubPages! All the dresses are very beautiful! It surely makes picking out a dress difficult. Danica, that one is gorgeous, isn't it, very figure flattering. So many dresses, why can't we just get married every year! The second dress of dressilyme.com is my fave. It looks sophisticated and luxurious. This is true,my DIY twin. In that case, they probably shouldn't be getting married anyway! Picking a wedding dress is HARD, some women have things stopping them from purchasing other than how it looks that they need to handle first! I hear you, JSeven. For me it's always the PLANNER, never the BRIDE! So true! I'm hoping for one more, LASTING marriage before I die, lol! Thanks, JSeven. Too bad we can't get married every day and get an opportunity to wear all these gorgeous things! What a pretty hub! 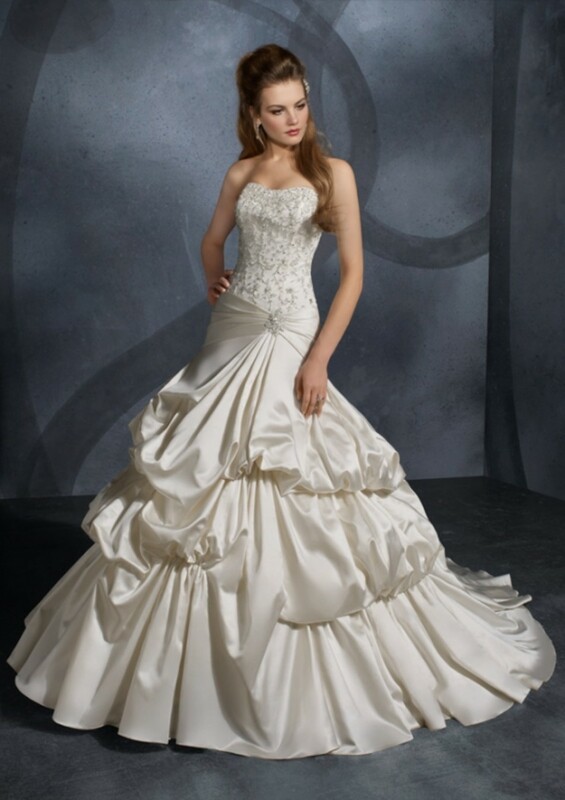 I love wedding dresses and like the ball gown style or the a-line ones with pretty pearls and sequins. :) Voted up and beautiful. Thanks, Brakel! You made my night! What a great writer you are. It's like you're just having fun talking to a bunch of people. Your personslity comes through in your writing. Beautiful dresses make you feel good all over. Can't wait to read other hubs. Good luck in your writing. Thanks, Jacqui! I'm an incurable romantic, so yes, working with brides is a wonderful thing...ahhh, love! What a fantastic hub. The wedding dresses are beautiful. You are so lucky to be in such a wonderful line of work. Really enjoyed your hub - voted up and awesome. Good luck with that, Jo, glad I could help! Oh! I so have to talk my sweetie pie to do a church wedding! I think I have found my dress on here. This is a neat topic..I voted up and awesome..especially if I can get him to walk me down the asile for a second time.. Thanks, Runway, glad you enjoyed it. Crystolite, Use the links and do some reasearch, good luck! Thats a wonderful outlet here. Can you help me check how much that Wedding dress cost? Thanks, Laine and good luck with that being a bride thing! now, id like to be a bride soon with these dresses! great hub here! Thanks, Moonlake, I'm sure she would! Makes me want to get married again, just so I can wear one! Beautiful gowns. 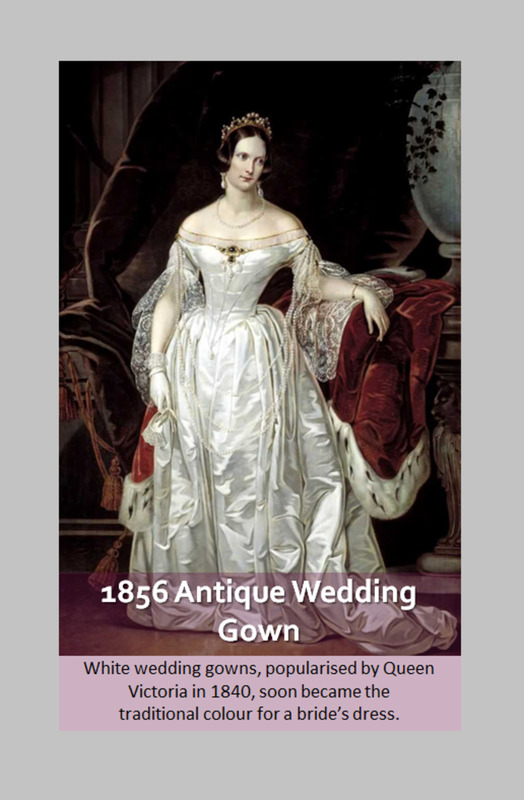 I have a granddaughter getting married in the summer she would look beautiful in any one of these gowns. Nice Hub. Thanks, Timtim, glad you liked them! Adoption is a great thing. More peope should do it. I wish you luck and then hopefully, you'll be walking that daughter down the aisle one day! Yes thanks, I have a son but as things got complicated with the wifes insides we can't have anymore children. I only wanted to have one more child, a daughter. Maybe I will be able to adopt one soon. Aw, patlesaux, that's so sweet! I wish I had some daughters to place these beautiful gowns upon them so I can walk them down the isle. Thanks, Ingenira. I wish I could wear them all, but that would mean I would have to get married again...and again...and again! I love the photos, the wedding dresses you have selected to display here are simply awesome and beautiful !! And what you said is true, they look nice on the model but they may not look nice on us, so we should always try them first to see how we look in them. Yeah, Denise, I decided I couldn't be a cake face forever. And yes, you did call it, I'm glad one of us had faith! Couldn't have done it without all the encouragement, thanks! Hey Patti, a FACE! LOL Congratulations on your win. Did I call it or what? Gorgeous wedding dresses! Thanks for sharing. Congrats on your nomination and good luck. Hey Girl! I KNEW I'd see you here. Congrats on your nomination. Your hard work is paying off. Cool. Good luck in the contest. (I am a past winner, as is my daughter Cara, who writes under cardelean). Nice going. Stunning photos. WOW! Thanks, Ripple, I'm slipping into something white and fluffy right now! Those are beautiful photos of wedding dresses. :) Surely a bride will find the perfect one for her! Thanks, ladyjane. If there's one thing I love is looking at wedding dresses! Nice job and great information. Thanks for sharing this the pictures were great. Cheers. Thanks, WMH! I love onewed, too. So many gorgeous dresses! These dresses are all so beautiful...www.onewed.com is my fave. Your hubs have been so fun to read...Have a Blessed Day! !